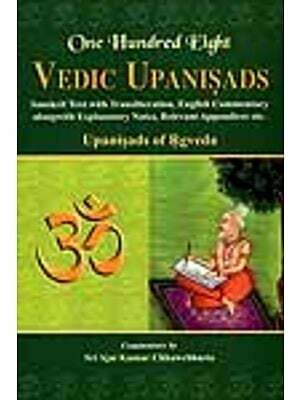 The Upanisads are philosophical and theological mystical treatises forming the third division of the Veda; the preceding portions being the Mantras or Hymns, which are largely prayers, and the Brahmanas or sacrificial rituals-the utterance, successively, of poet, priest and philosopher. There are two great departments of the Veda. The first is called Karma-kanda (the department of works) which embraces both Mantras and Brahmanas: and is followed by the vast majority of persons whose action of religion is laying up of merit by means of ceremonial prayers and sacrificial rites. 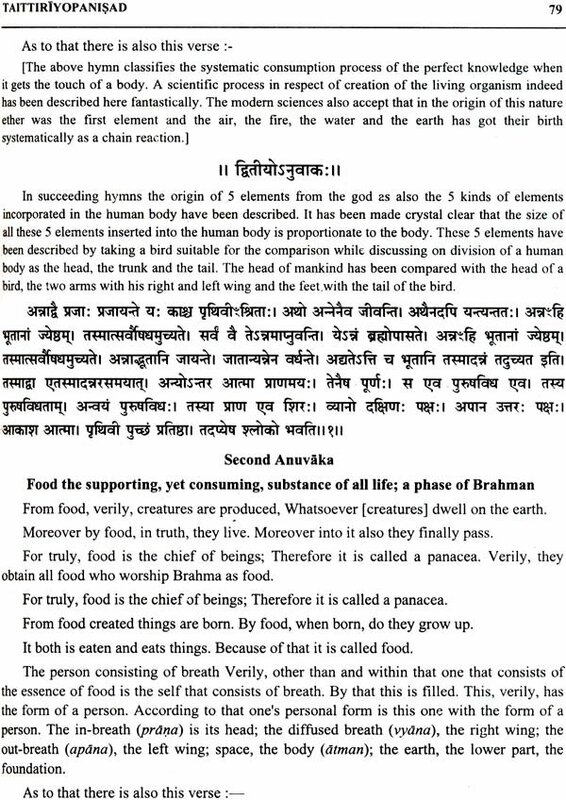 The second is called Jnana-kanda (the department of knowledges)-the theosophic portion of the Vedic revelation; and this is embraced by the Upanisads, and is intended for the select few who are capable of attaining the true doctrine. 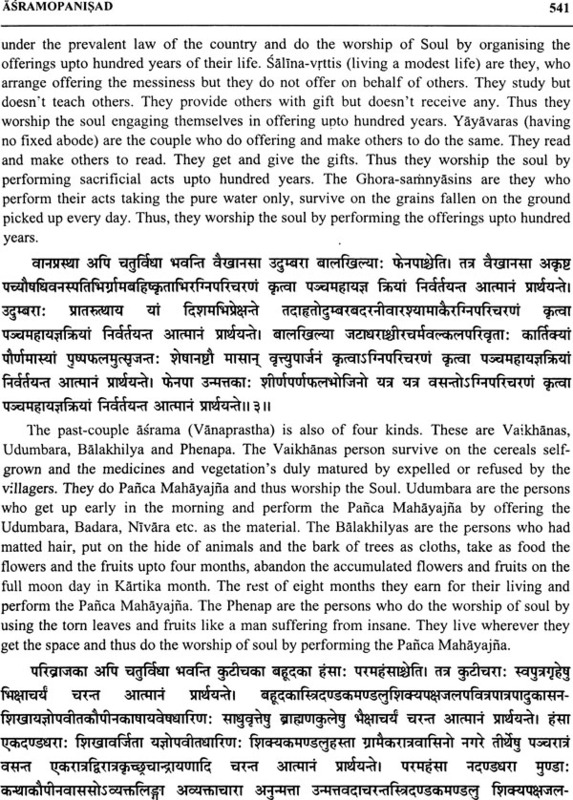 The most important of the Upanisads belong to what are called Aranyakas or forest-books, which form an appendix to the Brahmanas; and, treating as they do of the release of the soul from metaphsychosis. By means of a recognition of the oneness of its real nature with the great impersonal Self, are so profound that they were required to be read in the solitude of forests. By persons, who. Having performed all the duties of a student and a house-holder. Retired from the world to and their days in the contemplation of the Deity. The Upanisads undoubtedly represent the highest product of the Indian mind; and one of the most imposing and subtle of the systems of ontology yet known in the history of philosophy: and the Vedanta, styled by Sankaracarya ‘the string upon which the gems of the Upanisads are strung,’ is regarded as the finest flower and the ripest fruit of Indian spirituality. They contain the highest authority on which the various systems of Indian philosophy rest; and are practically the only portion of Vedic literature which is extensively studied by orthodox educated Hindus in the present day. The Present edition has been compiled with English translation of 112 important Upanisads many of which are being translated for the first time by a distinguished board of scholars. This edition provides an authentic translation of 112 Upanisads along with a completion index of verses and an exhaustive introduction. There are two great departments of the Veda. The first is called Karma-kanda, the department of works, which embraces both Mantras and Brahmanas; and is followed by the vast majority of persons whose action of religion is laying up of merit by means of ceremonial prayers and sacrificial rites. The second is called Jnana-kanda, the department of knowledges-the theosophic portion of the Vedic revelation; and this is embraced by the Upanisads, and is intended for the select few who are capable of attaining the true doctrine. 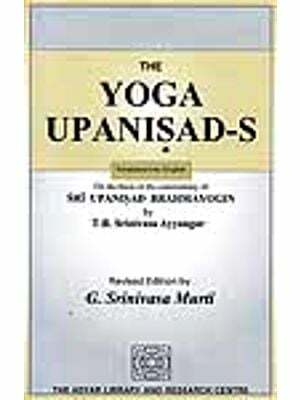 The most important of Upanisads belong to what are called Aranyakas or forest-books, which form an appendix to the Brahmanas; and, treating as they do of the release of the soul from metaphsychosis, by means of a recognition of the oneness of its real nature with the great impersonal Self and are so profound that they were required to be read in the solitude of forests, by persons, who, having performed all the duties of a student and a house-holder, retired from the world and their days passed in the contemplation of the Deity. The Upanisads are as far removed from the ancient poetry of the Veda as the Talmud is from the Old Testament and Sufism is from the Quran. They represent the results of the first plunge of the human mind into the depths of metaphysical speculation; and investigate such abstruse problems as the origin of the universe, the nature of the Deity, the nature of the human soul, and the relation of spirit and matter. The etymology of the word is doubtful. It probably signifies sitting down near somebody, in order to listen or meditate and worship (Upa-ni-sad); so that it would express the idea of a session or assembly of pupils sitting down at a respectful distance secret doctrine-a digest of the principles and mysteries contained in the Vedas; and some Indian philosophers derive the word from the root sad, in the sense of destruction; meaning thereby that the secret doctrine, fully apprehended, would destroy all passion and ignorance, and all knowledge derived from the senses merely-all knowledge save that of the Self. Now about the number and divisions of the Upanisads, with the disappearance of many of the recessions of the Vedas, many Brahmanas, Aranyakas and Upanisads also disappeared. The fact that the sacred books were not committed to writing in ancient times is partly responsible for this loss. Further more, among the works surviving, it is difficult to ascertain the exact number that should be regarded as authentic Upanisads. A religious system is considered valid in India only when it is supported by Sruti (the Vedas); hence the founders of religious sects have sometimes written books and called them Upanisads in order to give their views scriptural authority. 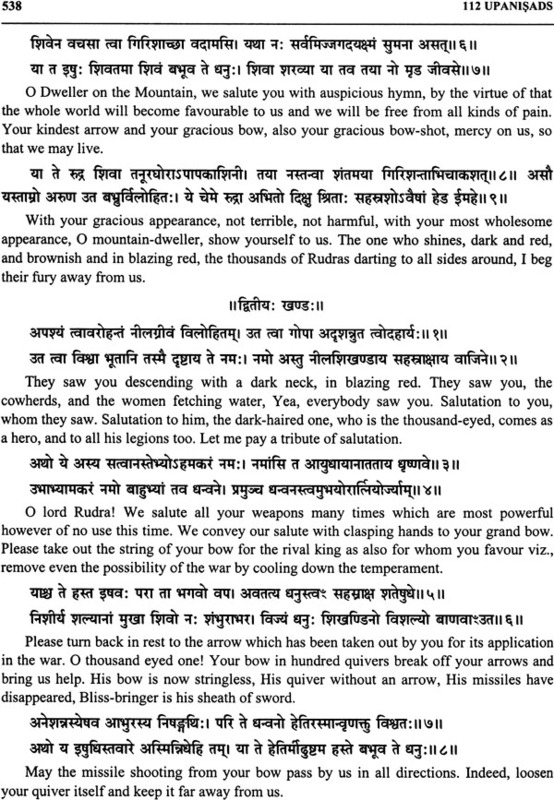 The Allah Upanisad, for instance, was composed in the sixteenth century, at the time of the Muslim emperor Akbar. 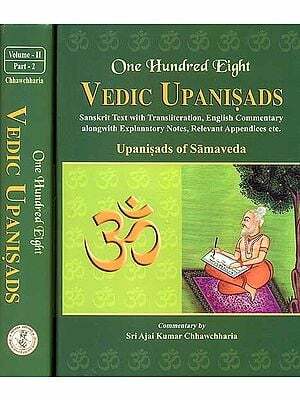 One hundred and eight Upanisads are enumerated in the Muktikopanisad, which is a work belonging to the tradition of the Yajurveda. Among these, the Aitaerya Upanisad and Kausitaki Upanisad belong to the Rgveda; the Chandogya and Kena, to the Samaveda; the Taittiriya, Mahanarayana, Katha, Svetasvatara and Maitrayani, to the Krsna Yajurveda; the Isa and Brhadaranyaka, to the Sukla Yajurveda; and the Mundaka, Prasna and Mandukya, to the Atharvaveda. 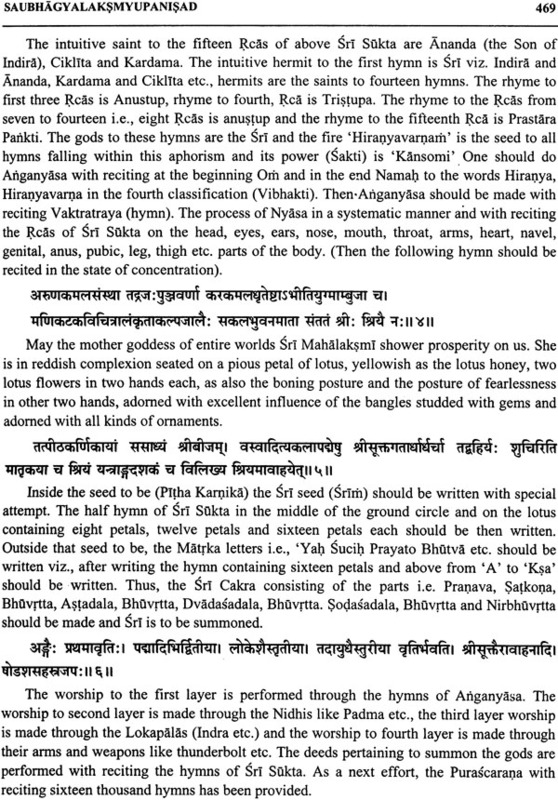 It may be stated, also, that these Upanisads belong to differing recensions of their respective Vedas. 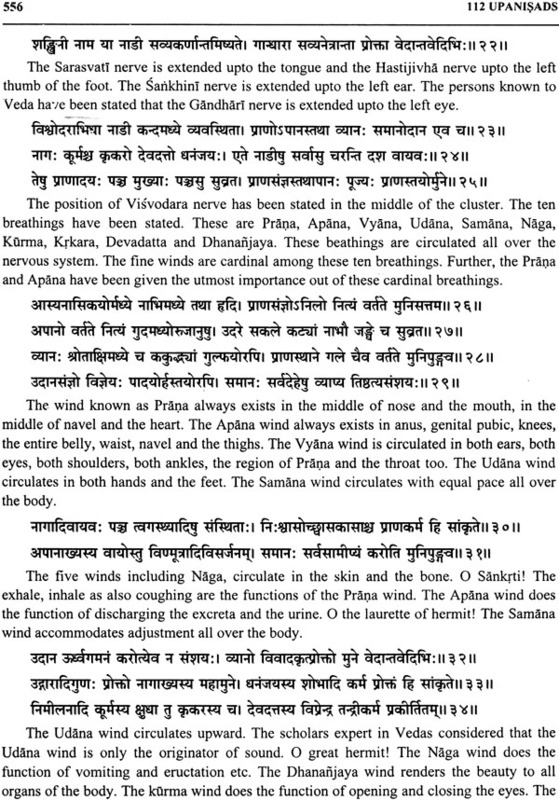 Thus, for instance, the Mundaka Upanisad belongs to the Saunaka recension of the Atharvaveda, while the Prasna Upanisad belongs to the Pippalada recension. 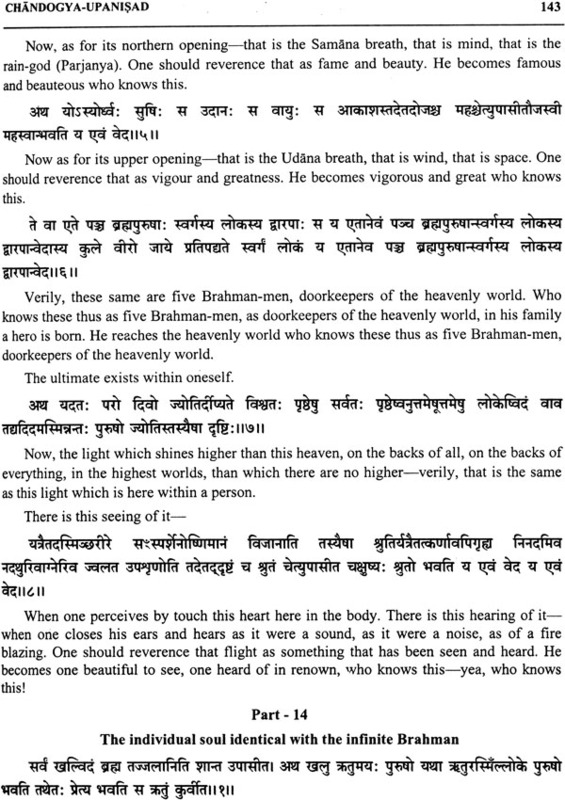 The Brahma Sutras, which is the most authoritative work on the Vedanta philosophy, has been based upon the Aitareya, Taittiriya, Chandogya, Brhadaranyaka, Kausitaki, Katha, Svetasvatara, Mundaka, Prasna and possibly also the Jahala Upanisad. Sankaracarya wrote his celebrated commentaries on the Isa, Kena, Katha, Prasna, Mundaka, Mandukya, Aitareya, Taittiriya, Chandogya, Brhadaranyaka and possibly also the Svetasvatara Upanisad. These latter are regarded as the major works. These are probably as old as the sixth century B.C. Or anterior to the rise of Buddhism and the fundamental Upanisads of the Vedanta philosophy. 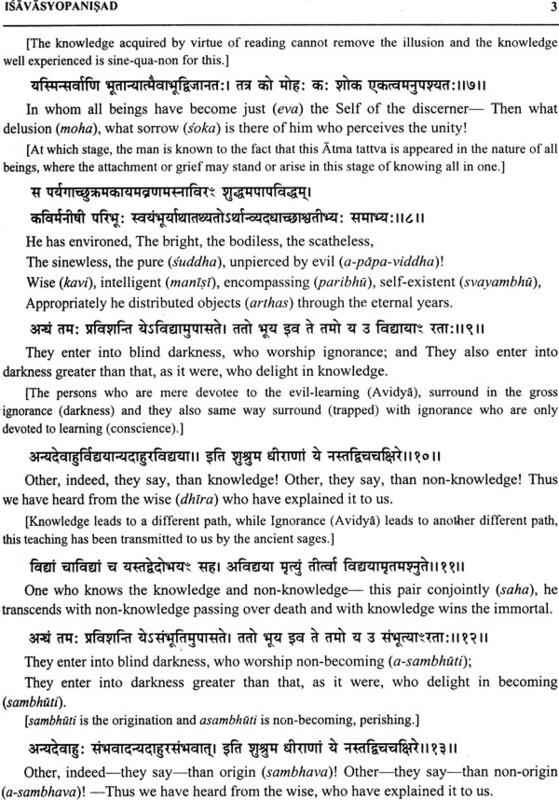 The teachings of the Upanisads, Bahmasutras and the Bhagavad Gita form the basis of the Vedanta philosophy. But the Vedanta has different schools of interpretation, represented by the three great Acaryas-Sankara, Ramanuja and Madhava; that Sankara being the oldest and most orthodox and in closest harmony with the ancient patheistic thoughts of India. The Upanisads undoubtedly admit of different interpretations. Their authors belonged to different sections of society, some of the most important being Ksatriyas or Rajput kings; and these generations of Vedic theologians had their own favourite sacred texts which they studied and speculated upon; these speculations coming in course of time to be locked upon as sacred too. There is unquestionably a certain uniformity of leading conceptions running throughout the Upanisads, though with considerable divergence in detail. 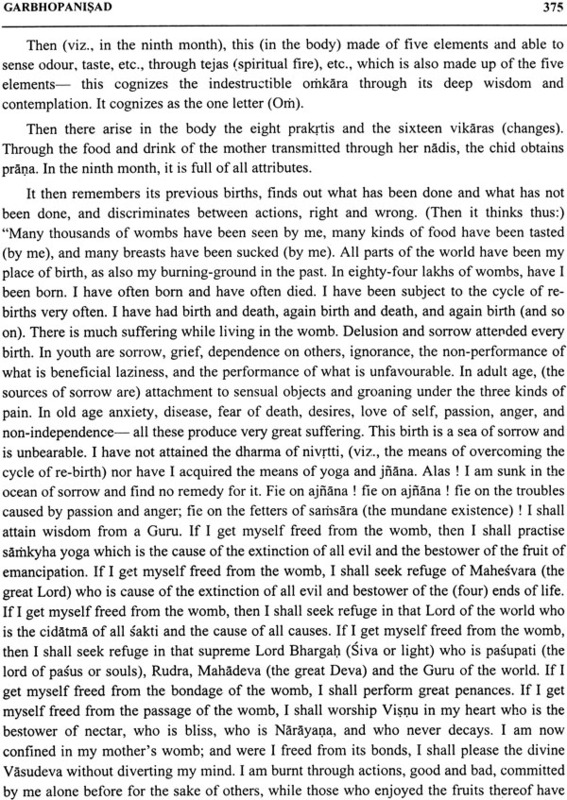 They were, however, never meant to form a philosophical system coherent in all its parts, and free from contradictions their authors belonged to different periods of time and do not claim any Divine inspiration that would preserve a continuous revelation of truth the views of one Supreme Being, whether He possesses qualities (saguna) or is destitute of qualities (nirguna), though the latter represents, as we shall see, the prevailing thought. They differ also as to the reality or unreality of the external world; and as to the nature of that soul, whether it is of minute size and an agent, and therefore finite, or whether it is identical with the Supreme and therefore infinite. All this invests these ancient treatises with not a little difficulty to those who study them; though their interest and value are not thereby diminished. The Upanisads undoubtedly represent the highest product of the Indian mind; and one of the most imposing and subtle of the systems of ontology yet known in the history of philosophy; and the Vedanta, styled by Sankaracarya ‘the string upon which the gems of the Upanisads are strung,’ is regarded as the finest flower and the ripest fruit of Indian spirituality. They contain the highest authority on which the various systems of Indian philosophy rest; and are practically the only portion of Vedic literature which is extensively studied by orthodox educated Hindus in the present day. The Vedanta philosophy has also its appreciators in Europe. Not to speak of its similarity in some respects to Berkeley’s Idealism, though essentially different, Professor Max Muller has represented it in an attractive light; and some German philosophers such as Schopenhauer and his ardent disciple, Professor Deussen of Kiel, confess to much enthusiasm for this particular wisdom of the East. These two speak of the study of the Upanisads as elevating and consoling. 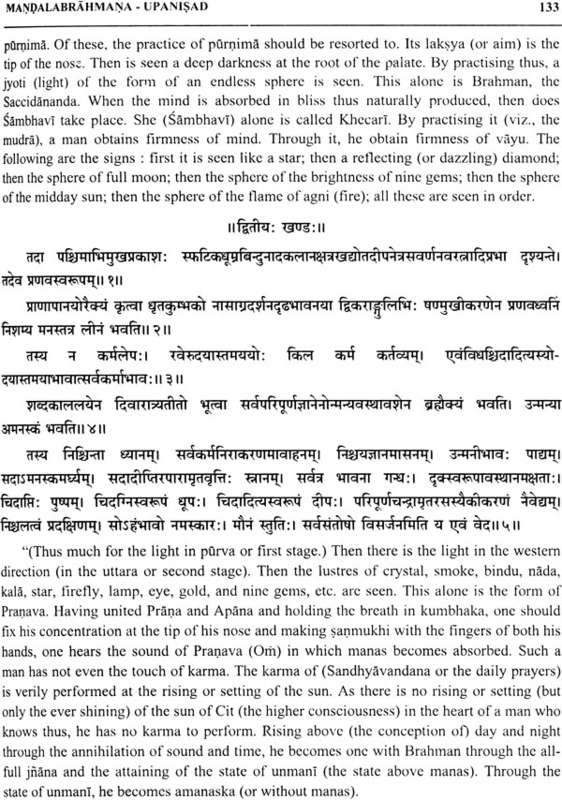 It is urged by modern Hindu Vedantists, that the school of German thought first expressed by Kant, completed by Schopenhauer and further elaborated by Deussen, brings the western world nearer and nearer to the Advaita or monistic position; and the Vedanta is claimed to be the key to all religions, the lamp by which all can be studied. Professor Deussen says of this system that it is “equal in rank to Plato and Kant”, and is one of the most valuable products of the genius of mankind in its search for the eternal truth. This is precisely what one can feel in studying the Upanisads. Though a perusal of the literature is a great intellectual treat, there is a strange medley of the sublime and the common place, of profundities and trivialities, of philosophy and superstition. 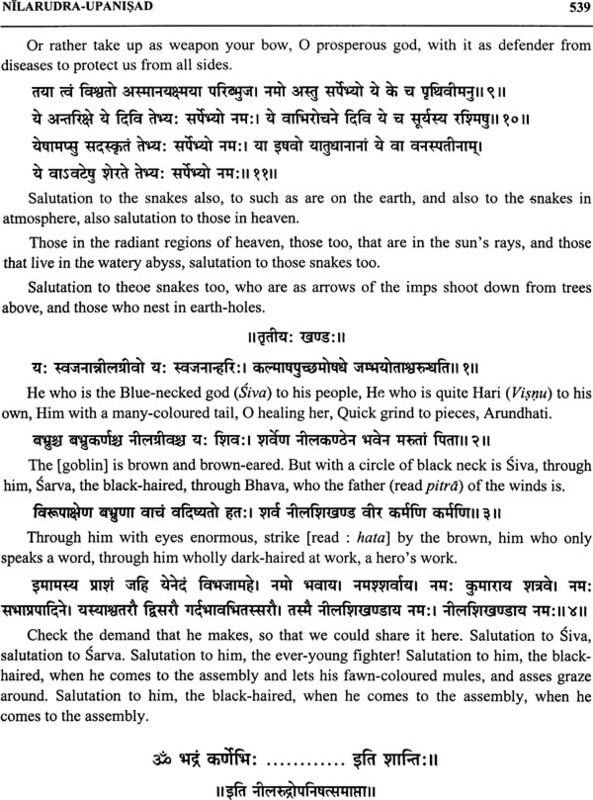 One can find there the nature worship of the Vedas, especially of the sun and mention made of 33 gods. One can find sexual relations even in the Supreme; that the Self divided himself into two and so produced husband and wife; and from these were “created everything that exists in pairs, down to the ants.” One can find details of Vedic sacrifices, of oblations of curds and honey and many puerile rites and superstitious ceremonies. One can find human greatness associated with children and cattle and fame and long life. 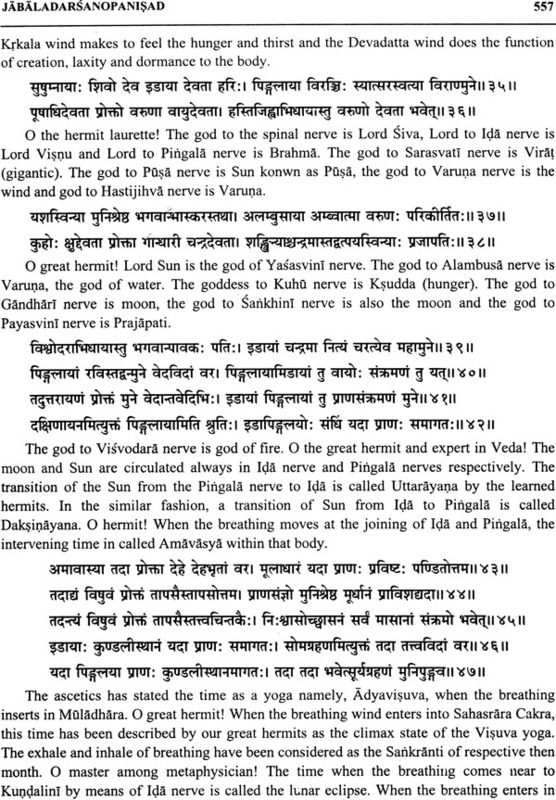 One can find astrology and strange astronomy, such as the soul leaving the body and passing through the air, coming first to the sun, and then at a greater distance, ascending to the moon; and the Hindu belief about eclipses-the moon escaping from the mouth of Rahu. One can find interesting evidence of the knowledge and practice of certain arts and sciences, such as melting of iron, pottery, wheel-making and the chemistry of metals; also that a Divine origin is claimed for caste; and such bewildering morality as this, that a man who knows a certain things, even if he commits what seems much evils, consumes it all and becomes pure and clean. One can find a full blown and elaborated doctrine of transmigration; and that those whose conduct has been evil, are born again as dog or hog, worm, insect, fish, bird, lion boar and serpent, rice and corn, herbs and trees, sesamum and beans. One can find also much importance attached to protracted bodily stillness and fixity of lock, to certain modes of breathing and to suppression of breath, to the mental repetition of strange sets of formulae, and to meditations on the unfathomable mysteries contained in certain monosyllables, such as the famous Om-the symbol of the Absolute under its three-fold personalization. One can find great subtleties of thought, expressed in such pregnant brevity that in very sentence we seem to read a page; a labyrinth of mystic language, tedious repetitions and puerile conceits; the use of fanciful metaphors and unconnected images, of defective analogies in place of proof, such as arguing from a rope being mistaken for a serpent to the unreality of the visible universe; or from the man with diseased eye who sees two moons where there in reality only one, to show that it is only ignorance (avidya) that takes the world as real; or from the fact that all earthen pots are in truth only earth, that the whole world is nothing but Brahman. One can find a want of system and of common sense; a tendency to speculate rather than investigate; and, therefore, controversies always beginning afresh, the solving of insoluble enigmas, the attaining unattainable frames of mind. But all these one passes over, unaccounted for and unexplained, and desire to notice rather the best features of the Upanisads, those that lift the human heart from the earthly to a higher level the elevated thoughts and noble conceptions; the deep spirituality; the pathetic guesses at truth and relation to the highest questions that the human mind can propose to itself. For in the groping after something felt to be needed, in the yearning of hearts dissatisfied and empty, lies the value of the Upanisads. In their seeking and searching after dissatisfied and empty, lies the value of the Upanisads. In their seeking and searching after the Infinite, these “Songs before Sunrise,” as they have been styled, must always have a profound interest for every devout mind. They do not claim as does the Bible to have a divine message for the world; neither do they contain as do the Vedas any fervid and beautiful prayers to God; they are rather psychological excursions about God. The Bible shows God in quest of man, rather than man in quest of God; and when thoughtfully studied and experienced, will be found to meet the questions raised by this ancient philosophy and to supply its only true solution. Thus we see the transcendental character of Indian thought; the yearning after the Beyond, the Unseen, the Infinite; the necessity to transcend the limits of all mere empirical knowledge; to penetrate the mere shell, and grasp the innermost kernel-the last of the several enclosing envelopes or sheaths, beyond which we cannot pierce. To such a mind, the finite is meaningless without the Infinite. This material earth has no abiding. Life is a dream and death a birth and an awakening. India is the land of the Infinite. Its skies are so deep and blue; its mountains are lofty and inaccessible; its forests are so dense and boundless; its rivers are so broad and long, that it is natural for the Indian to conceive the Infinite. And herein lies the peculiar strength of the Vedantist position, which all opponents of a materialistic or naturalistic philosophy must admire. When attacked, Hinduism has always kept open a line of retreat upon transcendental fortifications and has not attempted to make compromise with scientific research. 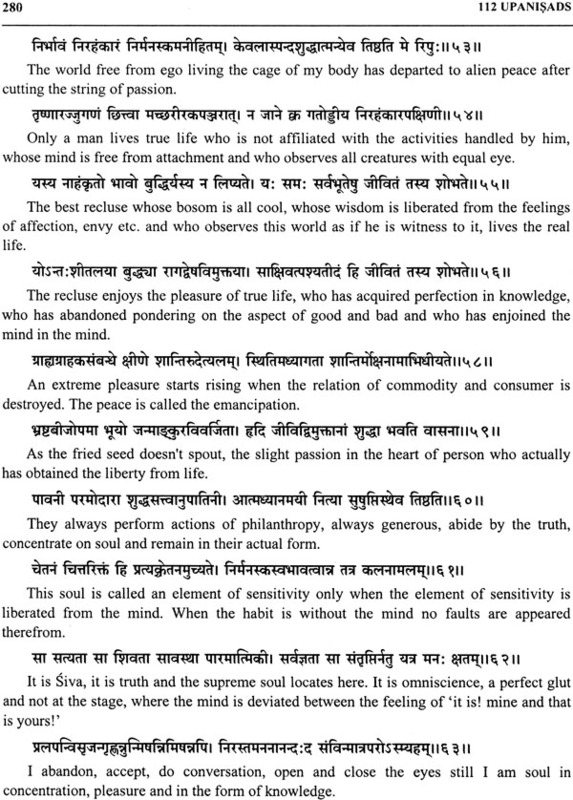 In harmony with what is best in the present philosophical thought of the West, the Vedantist affirms that the empirical school as expounded in recent years by Spencer, Mill, Huxley and others, leads logically to agnosticism, since its sphere of knowledge is limited to the world of sense perception. It is thorough going in its grasp of the physical half of the phenomenal world, but cannot comprehend the psychical-the region of man’s religious convictions and beliefs. It is here where philosophy steps into emancipate the scientific reason. It contrasts phenomenal with noumenal realities; it deals primarily with consciousness, or the mental world, maintaining that it is only of the Ego that a direct knowledge is possible; and the element of permanency in the material world of perception and in the mental world of self-consciousness, of which western philosophy has not obtained the clearest vision, is set up as an ultimate fact of philosophic analysis by the Vedantist, who always inquires into the ultimate bases of phenomena and declares that the Eternal cannot be known through the transient. The Supreme Being is believed, by the non-dualistic, Vedantist, to be associated with a certain power called Maya or Avidya, to which the appearance of the universe is due; and it is urged by some that it is called Maya or nescience, ignorance or illusion, because the world and its belongings stand in the way of our reaching to a knowledge of the ultimate truth-the eternal substratum of the world, the underlying principle of existence. The first step to the knowledge of the Supreme is the recognition of this permanent element. The latent capacity of men of transcending the finite and his affinity to what is universal and infinite, is the key to the evolution of religion; and ancient India supplies us with its earliest form. Now what was it that led the mind first of all to deify certain natural objects, and then to find beneath them all an enduring substance, passing from the worship of the elements personified to the worship of the power that rules over the elements? It was the sense of the vanity and unreality and fleeting character of all finite things; “the inadequacy of their satisfactions, the insecurity of their possessions, the lack of any fixed stay.” This feeling undoubtedly represents the earliest dawn of the religious consciousness, the elementary form of religious faith, such as we find in ancient India. It is a latter stage of thought that argues from the existence of the world to the notion of a First Cause-all-wise and omnipotent Creator. To the Indian, the all-embracing sky, the majestic sun, the silent stars, the everlasting hills, the noble rivers, become to the mind types of permanence and power, in the midst of a feeble and fleeting life; and these are forthwith deified. There we have the earliest and rudest form of religious worship. Gradually, however, as the mind became more reflective and philosophical these separate nature-divinities fade away and Nature is regarded as a whole; till, in the Upanisads, the religious consciousness attempts to pass beyond Nature, beyond everything, beyond ‘where words cannot go, nor mind,’ and to grasp an invisible Essence, which is neither the heavens nor the earth, but something infinitely greater and more abiding than all-pure Being the innermost Being both of nature and man. This philosophical synthesis, this pantheistic idea of God, implicit in the Vedas, explicit in the Upanisads, thus early rooted itself in Hindu thought; and out of it has gown all the moral and social life of the people. Pantheism in some form or another has pervaded the intellectual history of mankind, and fascinated some of the greatest thinkers of the world. For there is pantheism and pantheism. European pantheism has commonly made God to be co-extensive with all material things it has identified the world with God-all things being parts of the divine nature, i.e., the finite is the Infinite. Indian mystic pantheism, however, is very different, and is far more spiritual. It affirms not the deification of the finite world, but its nothingness : the formula that expresses it is not, the world is God, but the world is nothing and God is all in all-the One only Infinite Reality. It was thus, primarily, a true consciousness-the consciousness of the world’s nothingness-that gave rise to this conception, of a Substance beneath the shadows; that beyond the finite is the Infinite, summed up in the Indian dictum-“There is but one Being-on Second-” ekam ava advitiyam. It is the answer that the human mind at an early stage gives to the problem of the One in many; an attempt to give unity to its ideas by the aid of the logical category of Substance. For, just as behind the various qualities and changes of a flower there is something we regard as constant and permanent, so beneath all the surface appearances of things there is one and only one Reality that never changes-one Being, Brahman. And he who would know Him or it, must turn away from all sense perception and contemplate Pure Existence. At such a stage, when the mind was groping and guessing after truth, metaphors rather than formal reasoning governed thought; and the deepest reflections of philosophy were embodied in sensuous images. The Supreme Being is represented as saying, I am the light in the sun, the brilliancy in flame, the fragrance in the earth, the goodness of the good, the beginning, middle and end of all;” but what was meant was that God is the only Being that really is. Once admitted into the privileged circle of Theistic inquirers the pupil must have been made to go through prescribed courses of meditation and reasoning. What the lines of thought were which he followed in his attempt to reach rational or philosophical Theism, it is scarcely possible for us to discover with any amount of certainty. The instruction imparted must have been largely, if not exclusively, oral. The art of writing, even if introduced at all, must have been in its infancy, so that no records, properly so called, remain of the teachings of those who founded the philosophy of the Upanisads. 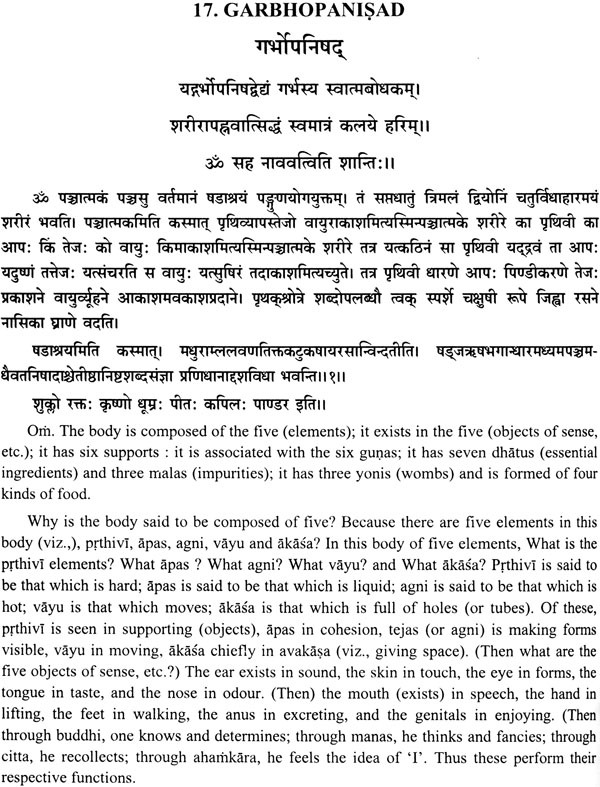 The Upanisads, however, are not systematic treatises on Philosophy. They contain, like the Bible and other ancient scriptures, exhortations on ethical and spiritual life, anecdotes, stories, poetry, psychology and devout utterances that are as often poetical as philosophical. But notwithstanding their unsystematic character, they contain the elements of system, a profound and magnificent system of Philosophy. Being the product of various authors and even of different ages, they are not free from contradictions even on important matters, though the philosophical reader, accustomed to tentative expressions of apparently conflicting but really complementary aspects of the same truth in philosophical literature, will find fewer contradictions in them than the ordinary reader. Though, however, a strictly self-consistent system can no more be gathered from the Upanisads than from any body of “sacred books” a general current of thought towards certain Philosophical doctrines may clearly be traced in them. This general current of thought in the writers of the Upanisads is all that we mean by the “philosophy of the Upanisads”. However, though as we have already observed, we have no proper record of the lines of thought which our old Theistic thinkers followed in reaching their conclusions, the conclusions themselves, and often the language in which they are clothed, indicate with sufficient clearness, the method adopted by them. There are, besides, here and there, passages containing more or less luminous philosophical analysis which throw much light on the logical processes through which the minds of the Rsis moved. Gathering these scattered fragments of light, we shall give a rough idea of the theistic philosophy of the Upanisads. 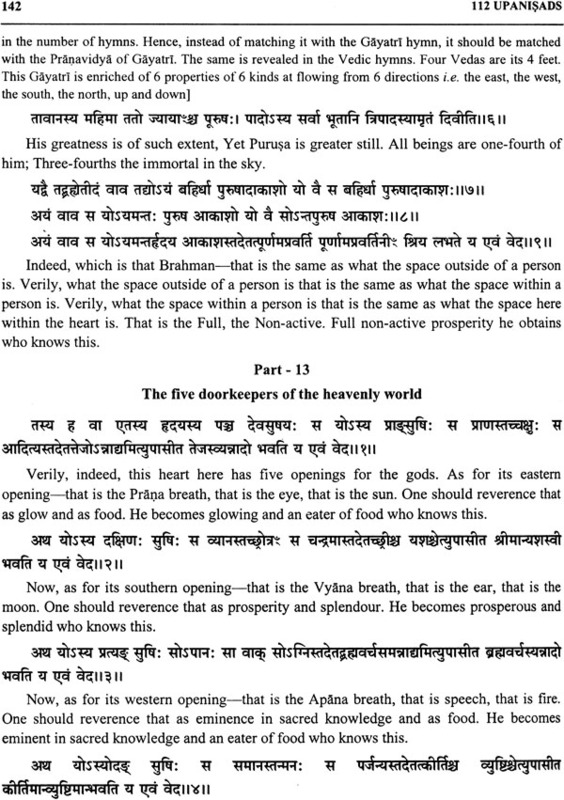 Such utterances may seem to some to indicate a Being whose existence is inferred from the indications of law and order in the world, a Being whose relation to Nature cannot be explained by the familiar relation of subject and object, and who, if he is directly cognizable at all, is so only in supreme moments of mystical insight. But the authors of the Upanisads’ unlike the natural Theologians of Europe, made little use of the Design Argument. The Reason in which they saw the world shine is not one of which they had any need to go in search of by the aid of ingeniously constructed arguments. They found it in themselves. It is identical with what every one calls his own Reason his own Self. It is that which is the subjects appear and exist for us. Let us hear how the Kenopanisad distinguishes subject and object and identifies God with the former (1-4-8). But by identifying Brahman with the subject or self in each person, do not the Upanisads make him limited and plural? They would indeed do so if by the ‘Self they meant anything that is, in its every nature, individual, particular. But by ‘Self’ the Upanisads do not meant any such thing. They mean by it, something that is, in its very nature, universal, that is common to all thinking individuals, the common basis of all subjects, animate and inanimate. 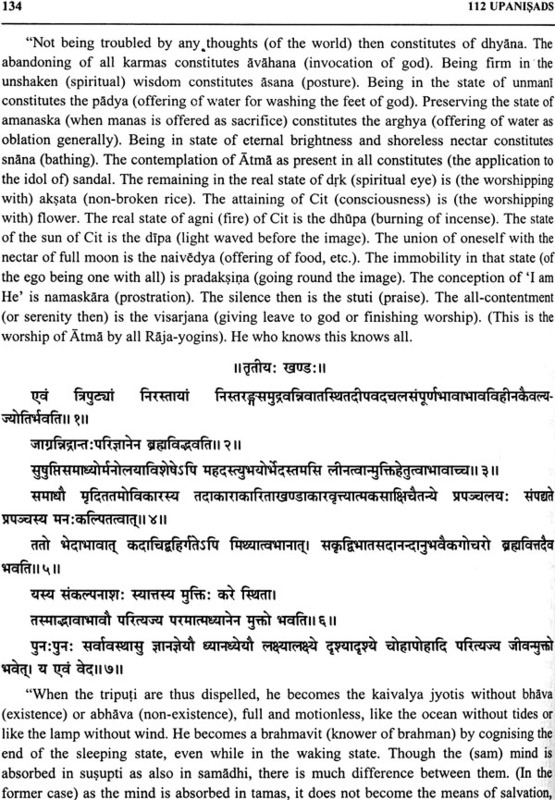 At each step of analysis, the Rsis names a category which comprehends the lower categories, till he comes to the highest category the Supreme Self, which transcends not only the sensorium and the intellect, where time and space end, but also that centre of spiritual activity to which, as a substance, intellect itself in referred as a mode or attribute. 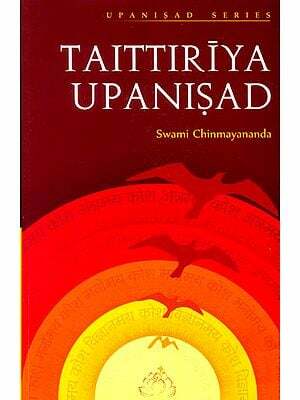 By the supreme person or Self therefore, the Upanisads mean something that transcends time, space and quantity, which belongs not only to me, a particular centre of spiritual activity, but to all such centres. 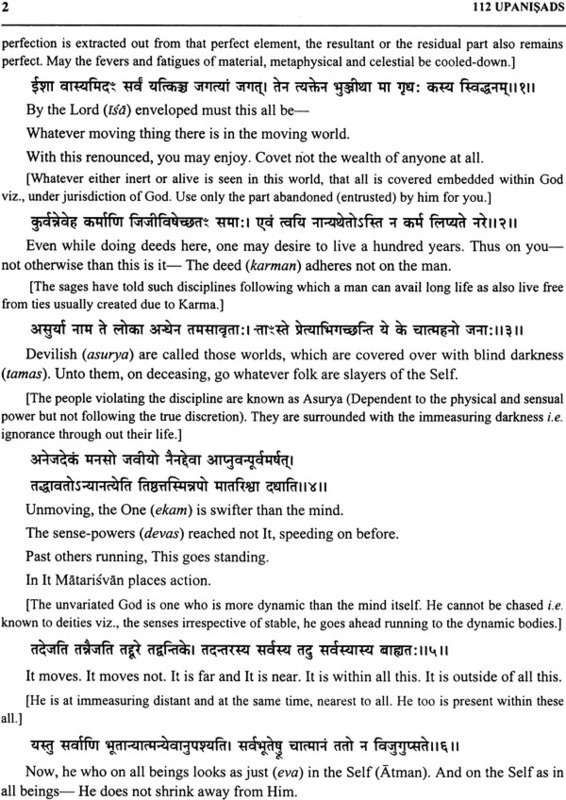 As the same Upanisad says :-What is here is made much more clear in the dialogue between Narada and Sanatkumara in the Chandogya step as Narada feels dissatisfied with each last, and at last he comes to Prana, Narada seems satisfied, as he cannot think of a higher category than life, with the departure of which every activity in use ceases. But Sanatkumara leads him to the highest category, where alone final satisfaction can be obtained, and that is the Infinite (Bhuma). But Narada like all minds in which the highest enlightenment has not dawned, asks, “Where does the Infinite abide, O Lord”? Just as we ask, “Where is the Self”? Or say, “The Infinite abides in its own glory,” but as if in anticipation of Narada’s question “Where is that glory”? Sanatkumara withdraws even this seeming limitation of Infinite and says, “It does not abide in its glory.” This Infinite, which comprehends all space and so cannot be anywhere in particular, is then identified with the Self, and the infinitude of the Self described in the words-“Verily I extend from below, I extend from above, I extend from behind, I extend from before, I extend from the South, I extend from the North. Of a truth I am all this”. It is then said that all the categories or objects enumerated above are products of the Self. No demonstration, in the ordinary sense of the term, is offered of this apparently starting position that the Self in us-that which makes us knowing, thinking beings, is infinite and one in all. This may be partly due to the Rsis not being perfect masters of the art of exposition, but it seems also in part, due to the fact that the truth appeared to them too plain of require any formal demonstration. To us it seems that when one has brought to a focus all the scattered rays of light, the Rsis have thrown on the problem, it strikes one as a real demonstration, if ‘demonstration’ is the word for the revelation of a truth which forms the background of all knowledge, all thinking, all demonstration. In thinking of objects, we necessarily think of a subject. In knowing and thinking of the limitations of objects, even of mutually exclusive thinking objects or minds, we necessarily do so from the standpoint of subject which transcends all limitations, we do so only by identifying ourselves with a Universal which, since it is the condition of knowing and thinking limits, cannot itself be limited. In other words, it is not any individual, any particular centre of spiritual activity as distinguished from other centres, that knows and thinks limits as such, by the Infinite itself that does so; and in as much as the Infinite thinks my thoughts for me, I am one with it. There are also passages which seem to teach the utter annihilation of all that is finite and objective. Much depends upon how these passages are interpreted. We think, however, that spiritual experience confirms the interpretation which construes such ‘annihilation’ into the real subsumption of the finite into the infinite, the full consciousness on the part of the finite that in itself it is nothing, the Infinite is all-in-all.